Business continuity planning (BCP) is an important step toward disaster recovery in case an emergency arises. A BCP strategy allows a small insurance agency to prepare for the worst threats and risks that can befall a company. The difference between a BCP and a disaster recovery plan is the BCP takes employees, equipment, customers, and the continuation of business into account. 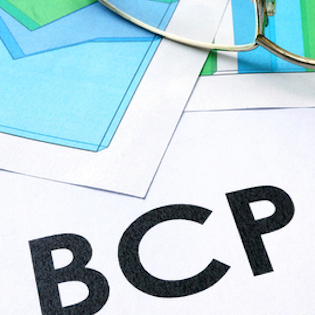 The BCP, once created, needs to be tested and maintained to be sure all elements of the plan are up to date. Personnel – This is where a pandemic or other personnel debilitating effect causes an immediate loss to many or all employees in a small amount of time. Destruction of Assets – In this case, assets means hardware and/or building destruction. A strategic BCP would be necessary for most natural disasters that destroy all or part of your business space. Power Outage – This pertains to a long-term loss of power. This is also one of the easiest disasters to overcome. While this may require relocation efforts, like the other two categories, if a solid disaster recovery plan is already in place with your cloud provider, then this will take minimal effort to recover from. These are all equally important, and all avenues need to be considered. Nearly 40 percent of small insurance companies do not recover after a natural disaster. Out of those, it is predicted that 90 percent could have if the businesses had a solid disaster recovery plan or BCP in place. This can be a bit difficult depending on the size of your agency, but the plan should be as detailed as possible. The first thing to do is to determine who the Business Continuity Team Leader is. This person will be responsible for gathering all required information from the IT department and support team. Each department should have their own part to play in the creation of the BCP documentation. FEMA has a basic BCP you can review here. Business functionality should be prioritized in order of importance. Communication during a crisis is a must, and studies have shown that social media is the best way to convey up to date information quickly. Have a Twitter or Facebook page dedicated to just the employees, so you can send information to them without the rest of the world finding out things you may not be ready to share yet. Contact vendors and find out what they can offer your agency in case of an emergency. Determine travel arrangements if needed. These are not arrangements for all your employees, but for the one or two persons in management who has to initiate the BCP. These individuals need to be located wherever the BCP has allocated as a backup office area: a hotel, secondary business park, etc. It is important to consider storing your backup data on more than one server. If you currently have everything stored in-house, then you have to ask yourself what you are going to do if a power failure or natural disaster strikes and stops you from accessing anything. The cloud can store your information on a regular basis, and if you request it, the data can be stored away from your current location so if a city-wide disaster occurs you can still access all your files via a mobile device. Larger insurance agencies have taken to deploying more than one cloud service provider, so the data can be accessed from two different locations if a disaster strikes. Download the white paper: Managed IT Services For Small Businesses. When shopping around for the right cloud service provider you want to make sure the provider can meet all the needs of your business continuity plan. Look for a provider that has experience with insurance agencies, and that has had the longevity you need to allow your business to continue to grow. Get a free assessment and see how TOSS can help you today to plan for tomorrow.